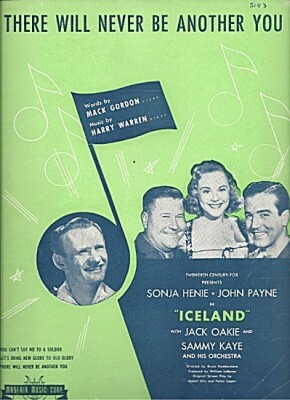 It’s ironic that one of Harry Warren’s most beautiful songs was written for a Sonja Henie vehicle called Iceland, starring Miss Henie and John Payne as a U.S. Marine stationed in Iceland during World War II. The song was introduced in the movie by Joan Merrill. Amazingly, this beautiful song was not nominated for an Academy Award. No matter. The song has become a serious jazz standard and has had many fine recordings, including Bennett’s 1959 recording with Count Basie and his 1962 improvisation with Dave Brubeck at the White House Sessions. Other significant recordings include those by Lionel Hampton, Chet Baker, Nat King Cole and Sonny Rollins. If there will never ever be another you. There Will Never Be Another You was recorded on December 30, 1958 and released in 1959 on the album In Person! . It was arranged by Ralph Sharon. “There Will Never Be Another You” was recorded on August 28, 1962 and released in 2013 on the album Bennett/Brubeck: The White House Sessions Live 1962. This number was from an unrehearsed improv set with the Dave Brubeck Trio. “There Will Never Be Another You” was recorded on May 22, 1968 and released that year on the album Yesterday I Heard The Rain. It was arranged by Torrie Zito. “There Will Never Be Another You” was recorded on January 31, 1971 and released that year on the album Get Happy with The London Philharmonic Orchestra. It was arranged by Torrie Zito. See Medley: A Weaver of Dreams / There Will Never Be Another You for more information.